YamCha is a generic, customizable, and open source text chunker oriented toward a lot of NLP tasks, such as POS tagging, Named Entity Recognition, base NP chunking, and Text Chunking. YamCha is using a state-of-the-art machine learning algorithm called Support Vector Machines (SVMs), first introduced by Vapnik in 1995. YamCha is exactly the same system which performed the best in the CoNLL2000 Shared Task, Chunking and BaseNP Chunking task. Use PKE/ PKI, whcih make the classification (chunking) speed faster than the original SVMs. For details, please see here. Multiple feature templates (e.g, F:-2..-1:4..15 F:1..2:4..15 F:0..0:4..) didn't work in the previous releases. Mr. Sameer Pradhan gave me a detailed report on this bug. Support NULL '\0' string in the parameters. Mr. Kazuma Takaoka. gave me a patch to fix the bug. mkmodel did not work well with Perl 5.8.1 or higer version. Change file formats of binary models. where foo.txtmodel.gz is a text model file generated with the option, MODEL=foo. Text model files will be found in your working directories. Support PKE (Polynomial Kernel Extended) which makes chunking (classification) speed significantly faster than the original yamcha. To enable PKE, create model files with -e option. Note that PKE is an approximation of the original SVMs. Fix FATAL error on compiling ONE-VS-REST model file. With this bug, YamCha would output an internal reserved tag (__OTHER__) instead of correct answer tag. Change the default sentence boundary marker from "EOS" to empty. Delete -f option, use -V option insted. YamCha is free software; you can redistribute it and/or modify it under the terms of the GNU Lesser General Public License. YamCha is distributed in the hope that it will be useful, but WITHOUT ANY WARRANTY; without even the implied warranty of MERCHANTABILITY or FITNESS FOR A PARTICULAR PURPOSE. See GNU Lesser General Public License. the for more details. Please let me know if you use YamCha for research purpose or find any research publication where YamCha is applied. Windows Version does not contain the training programs. Model files generated under 'i386 Linux' can be used in MS-Windows version. You can change default install path by using --prefix option of configure script. Try --help option for finding out other options. Both the training file and the test file need to be in a particular format for YamCha to work properly. Generally speaking, training and test file must consist of multiple tokens. In addition, a token consists of multiple (but fixed-numbers) columns. The definition of tokens depends on tasks, however, in most of typical cases, they simply correspond to words. Each token must be represented in one line, with the columns separated by white space (spaces or tabular characters). A sequence of token becomes a sentence. To identify the boundary between sentences, just put an empty line (or just put 'EOS'). You can give as many columns as you like, however the number of columns must be fixed through all tokens. Furthermore, there are some kinds of "semantics" among the columns. For example, 1st column is 'word', second column is 'POS tag' third column is 'sub-category of POS' and so on. The last column represents a true answer tag which is going to be trained by SVMs. There are 3 columns for each token. The following data is invalid, since the number of columns of second and third are 2. (They have no POS column.) The number of columns should be fixed. Here is an example of English POS-tagging. 5..8 (prefixes from 1 to 4) 9..12 (suffixes from 1 to 4). If there is no entry in a column, dummy field ("__nil__") is assigned. The first step in using the YamCha is to create training and test files. Here, I take the Base NP Chunking task as a case study. Assume a data set like this. First column represents a word. 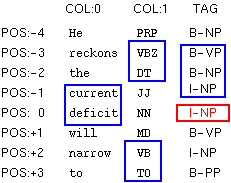 Second column represents a POS tag associated with the word. 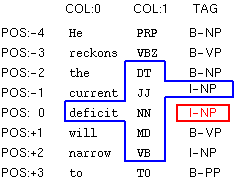 Third column is true answer tag associated with the word (I,O or B). The chunks are represented using IOB2 model. The sentences are presumed to be separated by one blank line. First of all, run yamcha-config with --libexecdir option. The location of Makefile which is used for training is output. Please copy the Makefile to the local working directory. There are two mandatory parameters for training. CORPUS: The location of file which is written in the training/test format. Here is an example in which CORPUS is set as 'train.data' and MODEL is set as 'case_study'. After training, the following files are generated. The last column is given (estimated) tag. If the 3rd column is true answer tag , you can evaluate the accuracy by simply seeing the difference between the 3rd and 4th columns. DIRECTION is used to change the parsing direction. The default setting is forward parsing mode (LEFT to RIGHT). 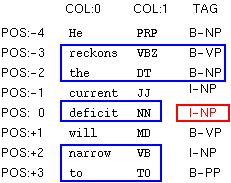 If "-B" is specified, backward parsing mode (RIGHT to LEFT) is used. Please see my paper for more detail about the parsing direction. FEATURE is used to change the feature sets (window-size) for chunking. The default setting is "F:-2..2:0.. T:-2..-1". "F:-2..2:0.. T:-2..-1" implies that contexts in the blue box are used as feature sets to identify the tag in the red box. More specifically, the contexts in the blue box can be divided into two parts -- green box (static feature F:) and light-blue box (dynamic feature T:). In this figure, the tokens at -2, -1, 0, 1, and 2 position are used as features. (green box). It means that [beginning positing of token] is -2 and [end position of token] is +2. In addition, this figure shows that 0-th and 1-st columns in these tokens are taken as features. It means that [beginning position of column] is 0 and [the end position of column] is 1. You can omit the [end position of column]. If omitted, the last column is set as [end position of column]. Note that column for answer tag is not regarded as [end position of column]. By taking tokens as well as columns, final expression of static feature becomes "F:-2..2:0..1". In this case, you can use "F:-2..2:0.." which means same as "F:-2..2:0..1". Dynamic features are decided dynamically during the tagging of chunk labels. It means that [beginning positing of tag] is -2 and [end position of tag] is -1.
have not been identified yet and cannot be used as features. You can use the expression F: and T: repeatably. All duplicate entries are deleted. Here are more complicated examples. Here is an example of setting "F:-3..3:0.. T:-3..-1" to the FEATURE parameter. Note that the expression of "-2,0,2" is different from "-2..2". ".." represents a range between beginning and end position. You can define some call-back function which re-writes or adds task-dependent specific features. For more detail, see example/example.cpp. MULTI_CLASS is used to change the strategy for the multi-class problem. The default setting is pair wise method. If "2" is specified, 'one vs rest' is used. SVM_PARAM is used to change the training condition of SVMs. Default setting is "-t1 -d2 -c1", which means the 2nd degree of polynomial kernel and 1 slack variable are used. Note that YamCha only supports polynomial kernels. Please use -m SIZE option to increase the memory for training if possible. This option drastically reduce the computational cost and time. 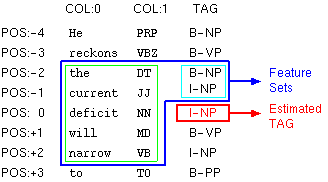 The -V option sets verbose mode, where yamcha outputs tag and scores of all candidates. The meaning of score varies with multi-class methods. The -e option sets the sentence boundary marker. Default setting is empty (""). Here is an example of changing the sentence boundary marker to "EOS"
Generally speaking, in the partial chunking mode, candidates are listed instead of last column. In the partial parsing mode, yamcha must be run with -C option. Note that the interpretation of test data varies according to the -C option. 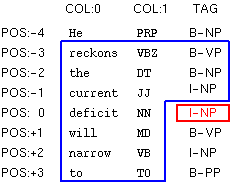 With -C option: the last (or more) columns are interpreted as candidates. Without -C option: the last (or more) columns are ignored. If -e is not given, PKI is employed. PKI is not an approximation of SVMs. It performs the same results as the original SVMs. PKI uses less disk space compared to PKE. PKE is much faster than PKI. As PKE is an approximation of SVMs, different results will be obtained. The approximation rates can be controlled by the following two parameters. -n NUM (minimum support): Use features which occur no less than NUM times in support vectors. Default value is 2. Smaller value gives a better approximation. -s SIGMA (weight threshold): Use features whose weights are between -SIGMA and SIGMA. Default value is 0.005. Smaller value gives a better approximation. Here is an example where NUM and SIGMA are set to be 1 and 0.0001 respectively. Please see our paper for details. Kiyonori OHTAKE who gives me a number of patches to fix bugs. Kaoru Yamamoto who reviews this manual. Yuji MATSUMOTO who is my supervisor.